Earlier this year at our Build conference, we previewed Microsoft Azure Quickstart Center designed to help you quickly start your projects in Azure with step-by-step guidance. Today at Ignite, we’re excited to share enhancements to the Azure Quickstart Center experience helping you set up your Azure environment with best practices and guidance from Azure. You can access Quickstart Center either from the All services menu under the General category, or simply by typing Quickstart in the global search. Create an Azure Service – You can learn as you build new workloads in Azure and quickly identify which service is best for your project. Set up your environment – You can configure your cloud services with recommended best practices to secure, monitor and control your Azure environment. Microsoft Azure Quickstart Center helps you quickly identify which service is best to get started for your specific scenario. 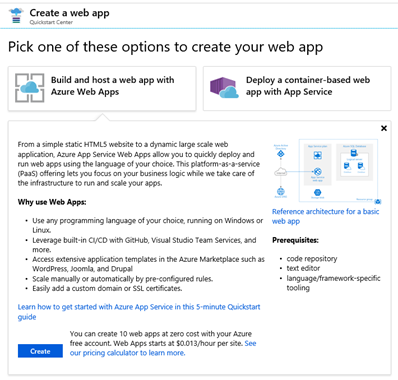 For instance, if you’d like to build a web application in Azure but don’t know how to start or which services to choose from, Azure Quickstart Center helps you understand the options available for web apps, gives you a high-level architecture overview, explains any prerequisites and even provides the costs associated with these services. Web apps – Pick from simple web applications to container-based apps, or a DevOps projects with a CI/CD pipeline. Virtual Machines – Deploy your virtual machine (Linux or Windows), or start a migration from an on-premises virtual machine. Storage – Create file shares for hot or cold storage, backup a file server, or configure a disaster recovery strategy in Azure. Database – Host a database from a selection of database options (structured or non-structured) for transactional or analytical scenarios. Big data analytics – Build a big data analytics and AI project and enrich your app with cloud-powered cognitive services. When you pick one of the options from these scenarios, it explains why you should use this option, what are the prerequisites, and even its cost. From here, you can simply click the Create button and Azure Quickstart Center will bring you to the create resource page. For this scenario, we picked a simple web app hosted on Azure. Note that the web apps may require other components as part of the project, such as a database. In that case, Azure Quickstart Center will offer you the option to create a database as well. Managing access – Learn how to assign who gets access to what resources. Understand how to use role-based access control in Azure (RBAC) to provide fine-grained access management to your resources. Organizing resources – Understand best practices to manage resources by grouping and tagging them so you can easily identify which resource belongs to which project. Securing and enforcing compliance – Understand how to apply policies to enforce corporate standards, and how to use Azure Security Center to not only protect your environment from external attacks, but also apply security recommendations. Monitoring and reporting – Learn how to monitor the health of your environment and metrics that help you understand the status of your Azure services. You can also set up alerts and actions that are triggered if certain conditions are met. Our goal is to help you bring your projects to life quickly while benefiting from the Microsoft-recommended best practices and governance guidelines. Give Quickstart Center a try today and let us know what you think at our feedback forum. Follow us on Twitter @AzurePortal.